GOTTA STAMP WITH SUZANNE JOHNSON: MDS MONDAY - A VALENTINE C.A.S.E.! I have mentioned before how Ann Schach's designs often inspire me. 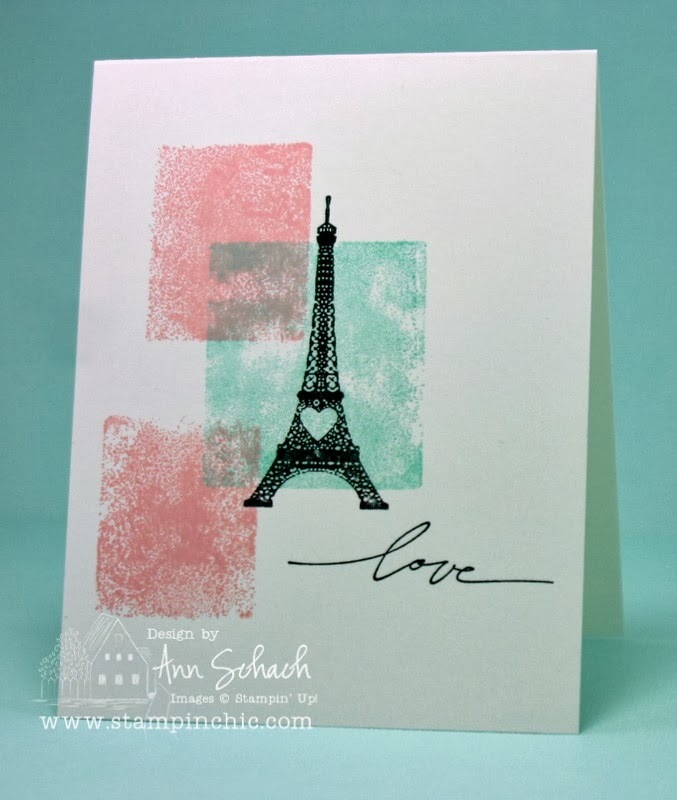 Today I am sharing a traditionally-stamped Valentine she made using the Eiffel Tower image from the "Follow My Heart" set (part of the current Valentine promotion) and my ALL DIGITAL C.A.S.E. of it using the "Artistic Etchings" stampbrush set (and more). Ann inked Stampin' Up! 's acrylic blocks to stamp the background squares with Pool Party and Blushing Bride. I used the MDS square punch filled with Vintage Overlays DSP/Texture 11 (zoomed in) colored Strawberry Slush and Coastal Cabana. I also cropped one of my square punches with the Wide Heart Punch shape. Ann used an image from the "Best of Love" 25th anniversary set to stamp the word "love" - I used a similar image from the "Walk in the Park II" stampbrush set. Ann's card is a wonderful example of a "KISS" card, which is "Keep It Simple Sweetie" - it's quick and lovely with one layer, no embellishments, simple one-color-per-image stamping. Mine has more, but because it is digital, it doesn't take any longer to create (no materials to clean up!). I had some tweeks: changing the square shapes to rectangles for the Coastal Cabana block and cropping a Strawberry Slush square into a heart. Once I sized one square and one rectangle, and colored each, I simply copied and pasted the additional shapes I needed, then rotated, flipped, and/or mirrored the copies. I resized the Eiffel Tower to fit where I placed it, and added a heart stamp (shrunk it down to size), colored it with Strawberry Slush and dropped a full blur/opacity Bermuda Bay shadow on it. I like a little bling, so I added Basic Rhinestones - for a hybrid you could add real ones. My final change-up were the matching-color background layers to frame my design. 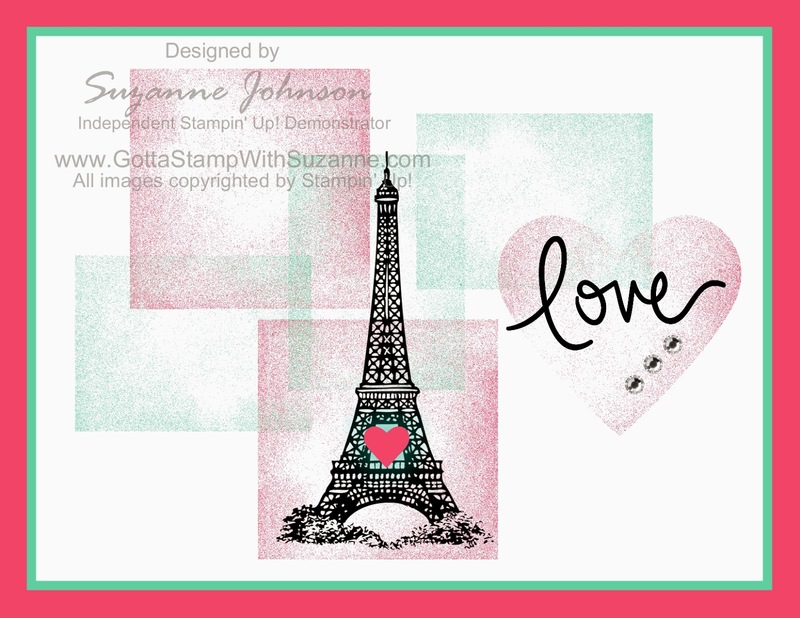 The funny thing is that before I saw Ann's card, I was already playing around with the Eiffel Tower image and the "love" script word for digital Valentine designs, which I will be sharing here soon!